Beach Lane Books, 9781442408340, 32pp. From wriggling chicks to jumpy kangaroos, this hilarious rhyming picture book showcases different kinds of babies, all of which are perfectly, adorably beastly! each is precious, every one. Mamas love their babies best. 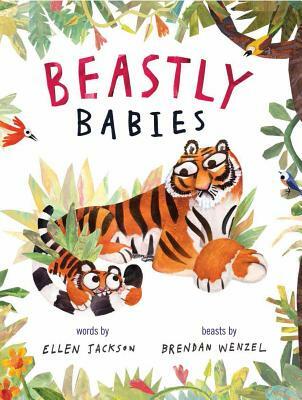 In this delightful rhyming read-aloud, author Ellen Jackson and illustrator Brendan Wenzel introduce readers to all sorts of mischievous baby animals—and the grown-ups who love them no matter what. Featuring puppies that slobber, kittens who spill, and young gorillas who won't sit still, this book is sure to resonate with beastly babies of all ages—and their exasperated moms and dads, too! Ellen Jackson is the award-winning author more than fifty-five fiction and nonfiction books for children, including The Mysterious Universe (a Golden Kite honor book) and Earth Mother (which garnered three starred reviews.) She lives with her husband and dog in Santa Barbara, California. Brendan Wenzel’s artwork often explores the natural world and our relationship to it and he has teamed up with many groups working to preserve wild places and creatures around the world. He has illustrated several acclaimed animal-themed picture books, including Some Bugs and Some Pets by Angela DiTerlizzi, Beastly Babies by Ellen Jackson, and his own They All Saw a Cat. He lives in New York. A simple rhyming text celebrates some shared characteristics of baby animals. Jackson catalogs a variety of animal offspring ("Babies can be smooth or hairy, / quail or whale or dromedary") and their behaviors: "Tiger babies pounce and fail / when they aim for mama's tail"; "Baby buffalo get grumpy. / Baby kangaroos get jumpy." The rhymes have a brisk quality that will keep the pages turning. Wenzel's bright illustrations, "rendered in almost everything imaginable," will grab the attention of small listeners. The wild profusion of young creatures, leaping, tumbling, and running as animal parents hover and peer from foliage nearby, is hilarious. All have round eyes and a kind of manic look, on the stern side for the parents (perfect in the cranky protectiveness of the mama tiger) but ready to go and full of spark for the babies....The unspoken reassurance—all babies are loved—is there, along with the important affirmation that growing up is both a little bit messy and a little bit chaotic. Toddlers may especially relish their status as creatures slightly older than babies while enjoying the affectionate tone of the text and art. Lots of fun. If there’s one thing that parents know, it’s that babies, as much as we may love them, are exhausting. And as this book shows, that’s true in the animals kingdom as well. This wonderfully tongue-in-cheek offering takes readers through some of those babies’ more, well, beastly aspects: they’re loud, they’re messy, and they never stop moving! This amusing readaloud is made more enjoyable by carefully crafted rhymes that delight both in their simplicity (“Puppies slobber / kittens spill / young gorillas can’t sit still”) and their cleverness (“Babies can be smooth or hairy, /quail or whale or dromedary”). The madcap, colorful illustrations are a joy: multimedia animals layer brightly over a white background, and, comically, the animals are all given particularly expressive eyeballs. Children of the human variety will be engaged by mischievous antics of their animal counterparts while parents will find kindred spirits in the depictions of exhausted, exasperated animal parents. Marvelously executed and affectionately crafted, this is a standout in the mothers-and-children canon that promises, like its subjects, to age well. "Babies can be smooth or hairy," writes Jackson, as Wenzel depicts a human baby alongside a kitten and wolf pup. A turn of the page continues the rhyme: "quail or whale or dromedary." The illustrations retain the animals' most prominent characteristics while also emphasizing their eyes. The book includes some scientifically accurate observations, such as natural instincts ("Beaver mamas/ chomp and gnaw,/ using teeth/ just like a saw"), and defense mechanisms ("Baby octopi squirt ink/ Baby skunks cause quite a stink"). But most pages are pure whimsy, such as a charming image of elephant calves tumbling against an adult elephant. Mayhem reigns on a double-page spread where "Puppies slobber,/ kittens spill./ Young gorillas can't sit still./ Mamas gobble, mamas cluck./ Barnyard babies run amok!" Readers can practically hear the open-mouthed hens, geese, roosters and turkeys as chicks scatter across both pages (one stares at the puppy; another seems to squawk at the gorilla). Discover: A joyous rhyming celebration of babies--smooth, prickly, furry and feathered. In this survey of animal offspring whose habitats range from the backyard to polar regions and the savannah, Wenzel (Some Bugs) wrangles species into wonderfully improbable compositions (a quail family dances in the spray from a baby’s whale’s spout, while a little dromedary mischievous spits on the whale’s nose) and vivid single-animal vignettes (a baby tiger goes on a hunt with its mother, but can’t even catch her tail let alone dinner). The visual magic of these pictures has two sources: the range of materials he employs and the animals’ intense, wide-eyed gazes, which bring to mind Sumerian temple figures and give even the tiniest critter a powerful emotional presence. Hopscotching over the messes animal babies tend to make and the ways they misbehave, Jackson’s (Tooling Around) brief rhymes...have an infectious rhythm, and they get an additional goose of energy from the book’s quirky typography.